Last Saturday my legs were ready for another road bike climb of epic proportions. In the same region as Alpe d'Huez, this climb has been featured 16 times since its introduction in the TDF in 1947. The top of the col is at 2067 meters, a full 200 vertical higher than Alpe d'Huez. I opened my eyes and saw that it was light. In fact, the sun was shining. Maybe the God of Weather had decided that me and Roddy had been punished enough on Alpe d'Huez. Then I realized the implication of it being light out - my alarm should have gone off while it was still dark! I sprung out of bed and into a flurry of small preparations. By the time breakfast was ingested, my jersey was stuff with snacks, and the water bottles on my bike were filled with sugary energy drink, the day had really dawned, and I thought that maybe this would be must easier than Alpe d'Huez. We had the weather on our side. I biked over to Gières to meet Roddy and the two Germans, Jonas and Andreas, who joined us now that the sun was shining. From the left: Roddy, Jonas and Andreas are ready to go! 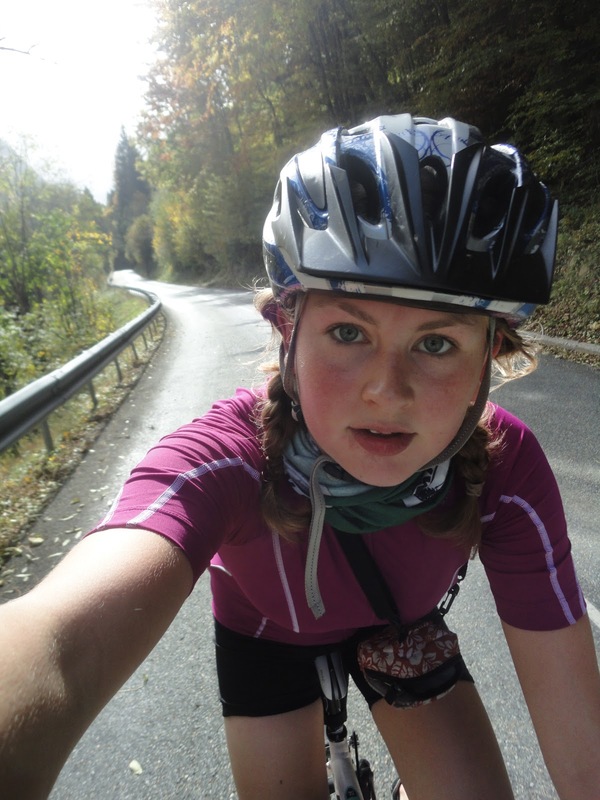 We pedaled up the well-known hill to Uriage, enjoying the sun and the road and anticipating the day ahead. In Uriage, Jonas and Andreas requested a stop to buy more snacks. Andreas bought an entire baguette and stuffed it in the back pocket of his jersey. I bought a Kinder Bueno, immediately demolished it, and 3 Lions which I saved for later. My theory is to keep my blood sugar so high all the time I can't possibly bonk. The bike from Uriage to the base of the climb was basically the same as Roddy and I had done for Alpe d'Huez - minus the rain. (Slightly blurry) action shot of Roddy and Andreas on the road towards Vizille. The kilometers flew by, as did the beautiful, deep valley that I had seen almost none of on my previous bike ride through there. We reached Allemond, and climbed up to Lac de Verney. We had turned into a new valley, and although the mountains seemed even bigger the slopes were gentler and covered in colorful trees. We had reached the start of the climb. Once we hit the climb, I realized I would be doing the next 30 km alone. The boys quickly disappeared up the hill, and I couldn't justify racing to catch them at the beginning of such a larger climb. And so there will be more selfies! The road was pleasantly isolated, winding its way up through the forest. I kept climbing though. I kind of hated myself for a while - for not enjoying the day enough, for being a whimpering puppy who just wanted to turn around, bike home and lie down. But if the boys were going to the top, then I was too. Col de la Croix de Fer is psychologically very different from Alpe d'Huez. There are no 21 numbered switchbacks with the altitudes signs. Col de la Croix de Fer starts with a seemingly endless road up through the forest, with no indicators as to how far you've actually gotten. You then arrive in the tiny town of Rivier d'Allemont. Rivier d'Allemond - look at those mountains. Then the road does a couple of switchbacks. Downhill switchbacks. Downhill?! I wondered if I had taken a wrong turn, but then I remembered that there had been no turn off. I was on the only road through the valley - and it was descending steeply. At the bottom of the descent the road crossed a river, bringing a welcome draft of cold air as I crossed it. I saw that the side of the valley I had come from was boulder-strewn, and the road probably descended to cross the river and take the other side to avoid avalanche danger. I started to think about the boys. How long ago had they descended the switchbacks? Were they waiting for me at the top already? What if I was way slower than them? How long would they wait? The road climb painfully steeply upward again, and I ground stubbornly away on my smallest gear. It then mellowed out and opened into a whole new world of scenery. I had turned another corner in the valley, and a shafts of light illuminated the mountain tops and slivers of the hillsides below. I was alone, just me and the mountains. And then I heard a noise. Vroooooom... Suddenly three motorcyclists came flying passed my, snapping my tranquility in two and leaving me with the brutal reality of my aching legs. I really don't like motorcycles. I figured this would take me somewhere in the vicinity of a hour. Breath in. Breath out. Pedal. That's one of the beauties of cycling, really. It takes almost now effort to force yourself to turn the pedals one more revolution, even if you're tired. And then you do it again, and again. And all of a sudden, in the distance, you see the iron cross marking the top of the col. Shortly after cross into the region of Savoie, with the Lac de Grand Maison in the background. I can see the top! 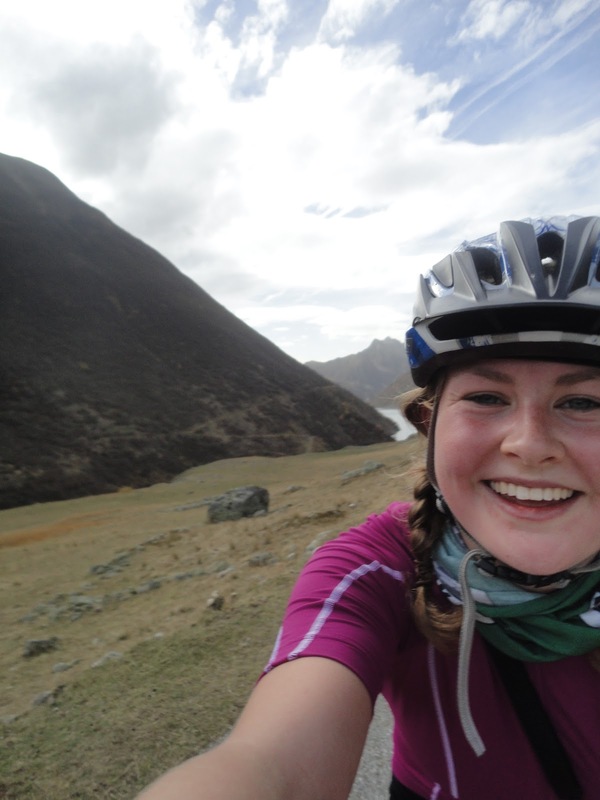 The last kilometers were more barren as I climbed above tree line, and more and more spiky alpine mountains popped up. They were also relatively flat, but still quite a grind because I saw the top long probably a few kilometers before I actually got there. And I was met by the familiar smiling faces of three tired cyclists. The boys with the Alpes stretched out behind them. 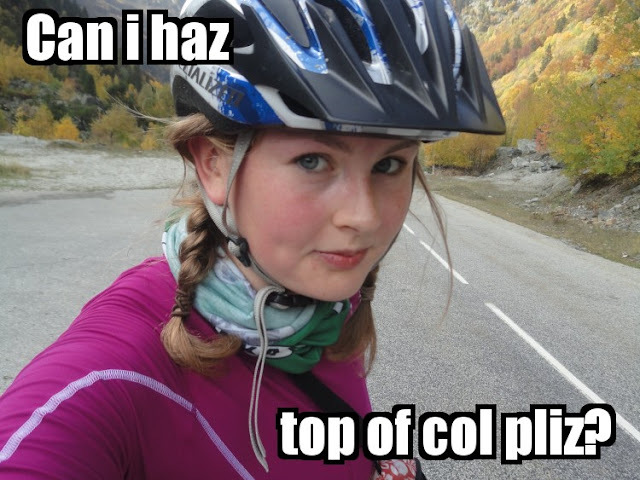 "That was like three times as hard as Alpe d'Huez!" I exclaimed, and Roddy agreed with me. It turned out the boys had only arrived about 5 minutes before me (actually 9 minutes according to Strava). Then I felt pretty good about myself. The iron cross for which the Col is named, and the proud climbers. The long descent was really rewarding. I felt like the climb disappeared into nothing as I whizzed down all the meters I had struggled up. When we reached the village of Riviere d'Allemont (after climbing up the switchbacks we had ridden down on the climb), we decided that the nothing would do but we had to have a celebratory beer. Jonas also picked up some crazy goat cheese from a farmer who had a shop in the village. Best beer ever. The goat above my head is on the building of the shop where we bought the cheese. The ride back was speedy and pretty much unremarkable, except that I kept getting hungrier and hungrier, to the point that I would just draft someone so all I had to focus on was the wheel in front of me. We stopped for snacks in Vizille, and a got a mini quiche and some sort of chocolate pastry that disappeared mysteriously before I was able to photograph them. 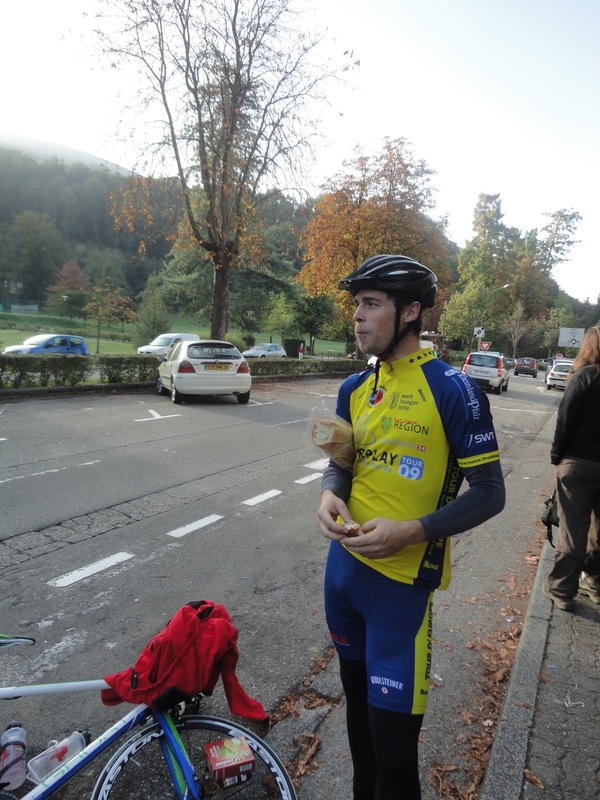 The patissier in Vizille in charge of the caloric needs of 4 cyclists who have done 135/150 km. We celebrated in the evening with tartiflette, wine, and goat cheese, and I went to bed early, thoroughly satisfied with my Saturday. Yes, because we ARE doing a repeat of all of this next spring when you come to visit me!! !